I’m an Oregon girl, born and raised. I generally take the seasons in stride, waiting patiently for the sun to peek out when it’s good and ready. This year is a little different. Granted, we didn’t have the relentless winter they had back east, but it still felt long and cold. I am beyond ready for spring. If it won’t come to me, I’m going to try summoning it with my wardrobe. Yes, my toes are a little chilly in my sandals today, but I’m optimistic. Maybe this tank will do the trick. 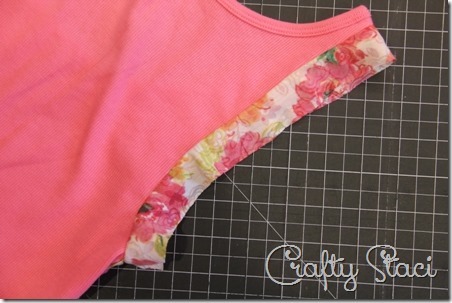 This started as a simple, unembellished pink tank from Old Navy and a piece of lightweight knit fabric. Measure the distance you’d like the fabric to overlap onto the front. In my case, that was 1/2”. Multiply that number by 3, then add 1/2”. You’ll also need to measure the arm and neck holes, adding about 3 or 4” to each. In my case, I cut two pieces that were 2 by 24” for the arms and one 2 by 35” for the neck. Fold one end of a strip about 1/4” to the wrong side, then line up the edge with the arm hole. Stitch away from the edge the distance of your original measurement, 1/2” for me. Be sure to use a stretch or knit stitch so your openings will still stretch. Continue all the way around until you cover the fold where you started. Cut off the excess strip. Repeat for the other arm. Press the trim away from the tank. Fold the trim over the edge to the inside of the tank. Make sure it covers the stitching line. From the front, stitch all the way around close to the fold as shown below. Repeat the process for the neck. Doesn’t this top doesn’t look like spring? 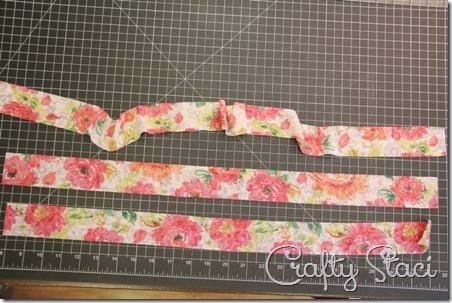 Join me again on Wednesday and I’ll show you what else I made from this pretty floral fabric!